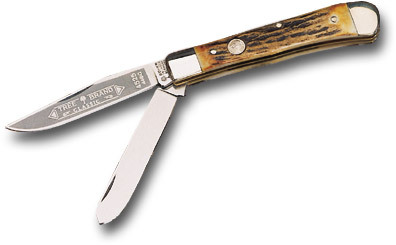 Boker Pocket Knife: A brief guide to help you find your perfect pocket knife. Thinking About A Boker Pocket Knife? I'd be very surprised if you didn't find at least one Boker pocket knife that seemed absolutely perfect. After all, there's quite a variety available, and I'd like to take this opportunity to introduce you to a few folding German knives in the size ranges that are the most comfortable and practical for carrying in the pocket. with a 2" drop point blade of Solingen stainless steel? And would you like Stag, Rosewood, Mother of Pearl, or Satin Stainless handles? These are models 1006, 1004, 1007, and 1003 respectively. The same small gentleman's knife in a rust-proof version with Titanium handles and a Ceramic blade? Look for models 2030 & 2031. Are you looking for a Boker pocket knife with total rust resistance? 2 1/8" drop point black ceramic blade. has designed a couple of slightly larger Boker pocket knives. The models 2076 and 2077 are Walker locks with 2 7/8" blades of ATS-34, and your choice of cocobolo or G-10 handles. have a single locking blade of Solingen Stainless. There are thumb studs on the blade so you can open them with one hand, and you can choose stag or bone handle scales. Look for models 4610, 4613, and 4617. Below are some of the Boker Copperliner Knives available today. 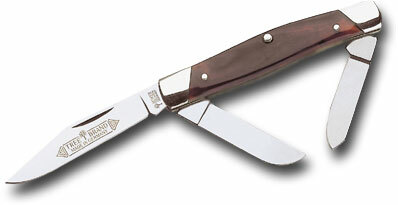 The model 93H is specially made for you, and offers a 3 1/4" Solingen stainless blade and a gut hook. Handle scales are rosewood, and there is a steel shackle/lanyard ring. There's also a canoe shaped Boker pocket knife available. Length is 3 5/8" closed, with pen and spear stainless blades, and gray bone handles. Below are some of the Boker Canoe Knives available today. Copperhead models are available with 2 stainless blades. 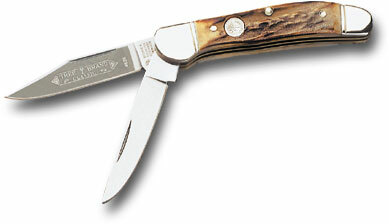 Closed length is 3 3/4", and you have a choice of stag or bone handles. Look for models 2626 and 4626. Below are some of the Boker Copperhead Knives available today. with 2, 3, or 4 blades. You can choose carbon or stainless blade material, and handles of stag, bone, rosewood, or faux tortoise shell. Above is a picture of the model 9885. Below are some of the Boker Stockman Knives available today. 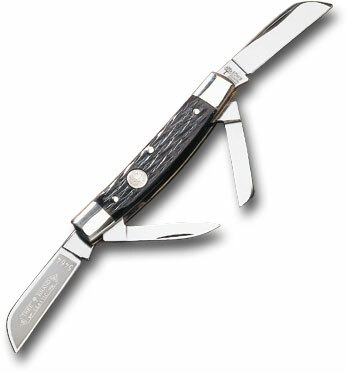 Trappers offer a choice of 1 or 2 blades of stainless or carbon steel. These knives are 4" to 4 1/4" closed, and here too you can choose handles of stag, bone, rosewood, or faux tortiose shell. Above is a picture of the model 4525.
there is very likely a German made Boker pocket knife that suits your needs perfectly. Have fun selecting, buying, and, most of all, carrying and using your perfect Boker Pocket Knife. Return from Boker Pocket Knife to the German Knife .com home page.